In a language rich with streamlined ornament, Breyten Breytenbach charts the geography of the land while, on a shifting plane, he conjures the landscape of the human heart. footsteps – your own, those of the ancestors, those of your companions. how you read the paragraphs of your life. In this single, long, prose poem, every paragraph has been given its own page or double-page spread. Each page is embellished with signs and symbols printed in multiple colors which have been inspired by the text. The type is hand set Samson and Libra printed letterpress on dampened 100% flax paper handmade especially for this book by Bridget O’Malley at Cave Paper. A horoscope, as well as the multicolored signs and symbols seen throughout the text, are drawn by Carolee Campbell and printed from photopolymer plates. Additional symbols are applied by hand using pure earth pigments. The boards are covered in flax paper hand-coated at the press with a mixture of ochre pigment and fine volcanic pumice. A second inner cover of flax holds the text and is sewn into the spine with a thin silk purple cord. An additional hardcover enclosure protects the book and echoes the theme of the artwork using an artful locking device. A separate chapbook containing a legend for the text-inspired signs & symbols completes the edition. 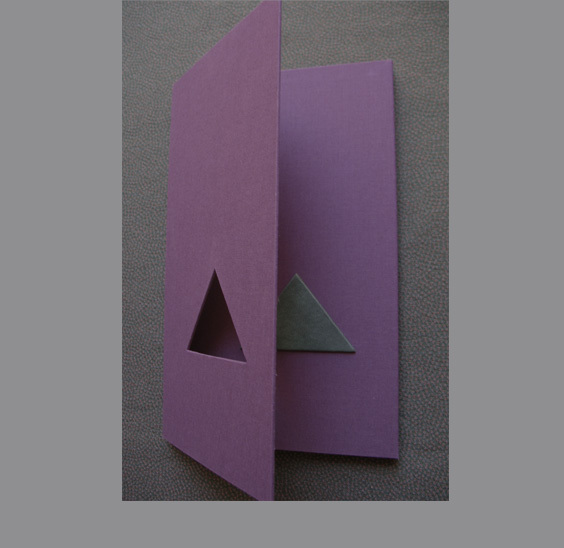 The chapbook is printed in eight colors with three additional hand-applied pigments on dampened Nideggen and is sewn with silk into a flax paper cover. The edition is comprised of 100 numbered copies signed by the poet with an additional 10 lettered hors commerce. 13 x 7.5 inches. 40 pages.